A couple of weeks ago, the watch manufacturer Artya offered the fold-out knife strap buckle because of its eccentric range of watches (which the manufacturer’utes own representatives refer to as “insane projects,” occasionally). The concept immediately brought to mind an regrettably much more serious attempt at combining two iconic Switzerland products: the actual Firefox dive view from the 1970s. Although it was the Victorinox Swiss Army manufacturer (which is honoring it’s 25th wedding anniversary of making Victorinox Swiss Army watches this season) that provided the edge, it is not Victorinox that could today need to solution the warranted question, “Exactly what were a person thinking? 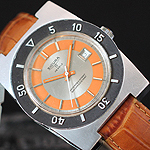 !” but instead the defunct (since 1979) watch company, Sicura. Sure, it certainly is in no way a bad idea for a diver to carry the knife, but wait , how might anyone actually think about integrating such a little edge right into a view situation? Especially about the wrong aspect of the case?